If you are passionate about having a well-maintained garden, but the lack of time is the reason why the lawn is overgrown and the bushes are shapeless, it is time to get in touch with us and we will get these issues solved on your behalf. We offer a vast array of professional gardening services at competitive prices. As for the grass cutting, it is performed by experienced gardeners, equipped with the most powerful tools. They are available in the area of Balham seven days a week. Feel free to contact us and make a booking at any time. SW12 – based customers who have already taken advantage of some of our services know that we never tolerate mediocre results and the grass cutting service is not an exception. Although it is considered an easy to perform project, it actually requires precision as well as experience. 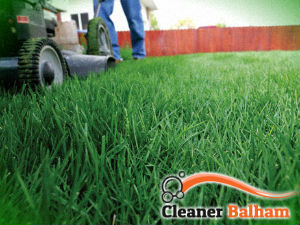 Preparation of the lawn and the usage of a powerful mower should not be underestimated as well. 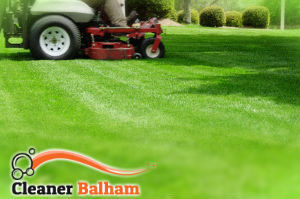 We deliver grass cutting services in both commercial and residential properties. No matter if you want to make your garden a cosy place or you need the lawn well-maintained for impressing your visitors and customers, you can rely on our professionalism and efficiency. Our teams, serving the Balham area have flexible working hours, so you can set the service delivery for a day and a time that suits your busy timetable. Contact us now and make a booking. Our operators will be glad to lead you through the booking process. Copyright © 2019 Cleaners Balham. All Rights Reserved.